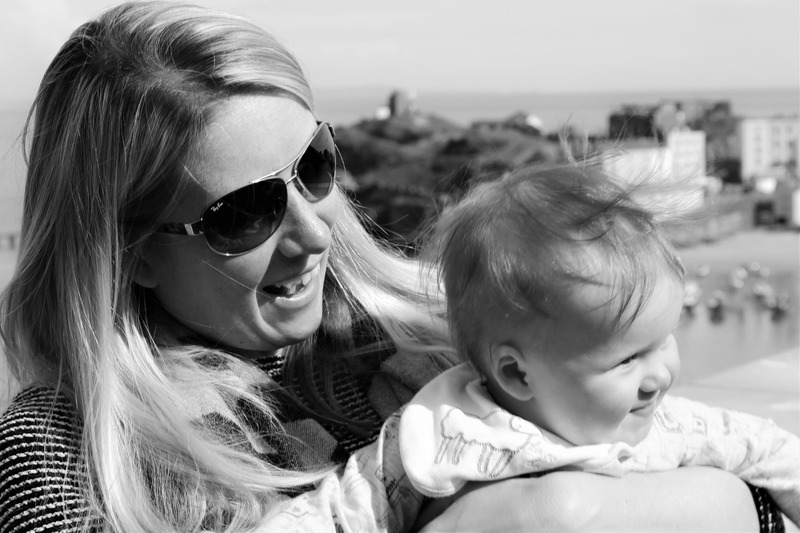 I never really wrote about our first birth; the birth of our daughter nearly three years ago. 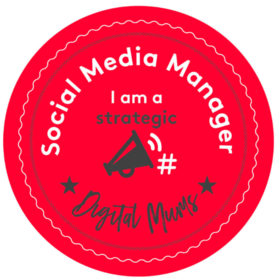 I’ve included it in some blog posts, but not in the detail it deserves. The real reason for this was because I wasn’t writing this blog of mine at the time. My first birth was an induction. When our daughter didn’t arrive after two weeks post dates we were booked in for an induction. 60 hours later and after all the drugs, it ended up being a semi-emergency c-section after failing to progress. It left me exhausted and over-emotional afterwards, wondering what the hell happened and in shock. This time round I was determined for the experience to be different. 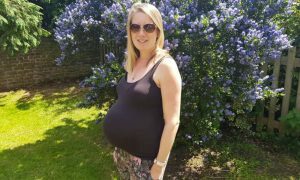 During my pregnancy I had many conversations with midwives and my consultant, and we agreed that I would be booked in for an elective c-section between 40 and 41 weeks to give my body a chance to go into spontaneous labour. There would be no induction this time round due to my already scared uterus and wanting to avoid going through another 60 hours of pain that would end up (most likely) becoming an emergency c-section. The last pregnancy picture, taken the day before Bertie arrived. What I hadn’t banked on happening was going into labour. So here’s what actually happened. 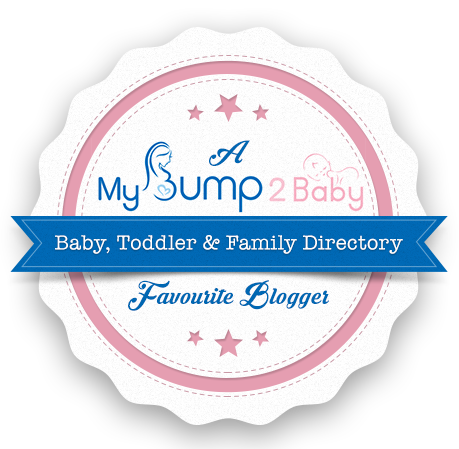 Between 39 and 40 weeks I started to experience regular tightenings at night, making sleep virtually impossible. They would happen every 10 or so minutes, and completely disappear during the day. This pattern continued for a week, and the day before my due date they started happening every 5 minutes, sometimes down to 3 minutes. I rang the hospital at 2am in the morning who told us to come in. We had to wait a few hours for my parents to arrive to look after my daughter and by 5.30am we were on the labour ward, at which point the contractions had pretty much stopped. The midwives monitored me for over an hour and confirmed that my cervix was closed and posterior. We were at this point given the option to go home or stay in until my elective c-section date in 5 days time. We opted to go home and wait it out, and to see if my c-section date could be brought forward. However two days later things really started to happen and luckily my daughter was at my parents in Cambridge, so there was no worry about what we were going to do with her. It started the day after my due date. I begun to have fairly regular contractions during the day, so we got the TENS machine out and I was timing them on my phone. Sleep that night was impossible and I tried to have a bath to ease the pain. Having a contraction in the bath is pretty horrific as you cant actually move. At one point during the night I became pretty hysterical as they were coming every 1 to 2 minutes, and it was this point I woke my husband from his slumber. The rest of the night was spent trying to keep calm and bouncing on the ball. At about 5am I rang the hospital again, and we went in at about 6am on Monday 4th June. The drive was excruciatingly painful, why are there so many speed bumps! Also the walk to the labour ward was hell, I’m not sure why the car park is situated at the other end of the hospital? We were quickly seen to and told that I was two centimetres dilated, which I was a little gutted about considering I had been having contractions for over a week. At this point we were offered a c-section, but I wanted to wait and see what happened in the next 4 hours. During this time we were moved from the assessment room to our own room, and the contractions slowed. 4 hours later I was still only 2 centimetres so we decided to go for the c-section. The doctors obviously explained the risks and part of me feels like I could have tried harder, however I didn’t want the same experience where I didn’t get beyond 3 to 4 centimetres in 60 hours. Plus I was exhausted from barely sleeping during the week. We had to wait another three hours from making the decision to it actually taking place, and during that time the contractions were getting quite strong and I was getting increasingly nervous about the whole thing. Thank god for the TENS machine to distract me. 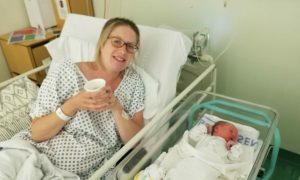 It was a surreal experience having the c-section but so much better than my first, as I wasn’t drugged up to my eyeballs with Pethidine and an Epidural. The spinal took quite a while to administer as they couldn’t numb my right hand side properly. The team who carried it out were fantastic, explaining what was happening the entire way through and constantly giving me anti-sickness drugs throughout as I felt pretty nauseous – but that may have been from the nerves. All I can say is that I had so much more feeling of what was happening this time round, no pain, but it felt like someone was doing the washing up in my stomach. At 4.10pm our little Bertie was born, he cried right away, and was held up over the screen. We didn’t have a choice of music so the doctors put on a random Spotify playlist and he was born to James Bay – Let It Go. We had a few cuddles, before he disappeared into the recovery room with my husband, who was told not to look as he walked past me. Afterwards we were informed it had all gone well, and I had only lost 500ml of blood compared to 2 litres with my daughter. The surgeon did say to me that my previous scar was really thin and may not have withstood a full blown labour so it was probably a good thing we opted for the c-section when we did. That made me feel a little bit better about not wanting to try any longer for a VBAC. Once we were wheeled into recovery it was lovely to meet our little boy. He pretty much fed right away, and I was desperate for a cup of tea, but I wasn’t allowed that. We were then taken to the maternity ward where we spent the next two nights before being allowed to go home less than 48 hours after having him. I can honestly say that even though I had a c-section this time round the experience was so much better. I felt more in control, it wasn’t as long, and feeding was so much easier. The recovery has also not been as bad as I thought it would be. I was up on my feet less than 12 hours after the c-section, it was bloody painful, but probably helped my recovery overall. So that’s our second birth story. It had the same outcome as my first, but overall was a totally different experience. One of the things I am grateful for is choice. I was never pushed or forced to make a decision, and the decision for c-section or VBAC was entirely up to me. 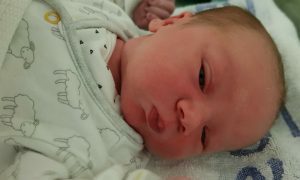 Welcome to the world baby Bertie, born at 4.10pm on the 4th June 2018, weighing 8lbs 2oz. 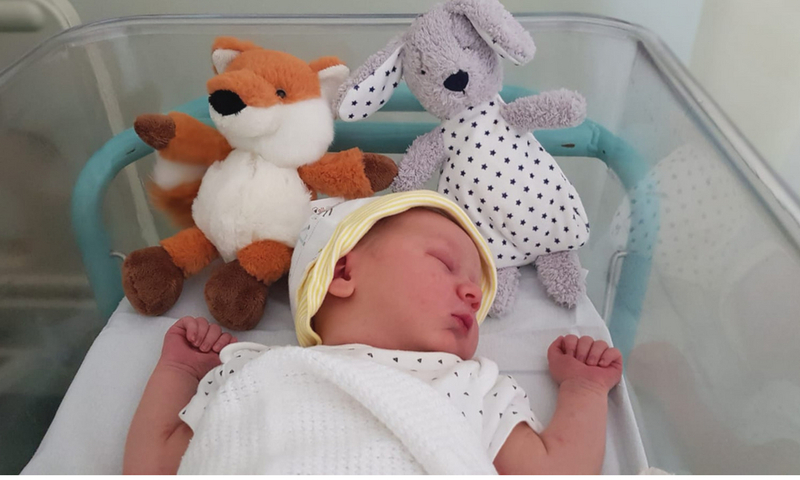 I would like to thank all the midwives, doctors, consultants, surgeons and anaethestists at Lewisham Hospital for looking after us and safely delivering our baby boy. You are all amazing! I love reading about other people’s birth experiences. You definitely shouldn’t think you didn’t try hard enough, you wouldn’t have had it in you to carry on waiting it out for hours or even days more! The C section experience sounds so strange being able to feel the sensations. 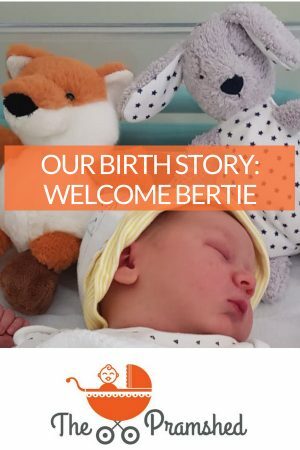 Well done, and welcome Bertie! Congratulations! Bertie looks scrumptious. C-section is so weird and yes very painful. Everyone at the hospital including the anaesthetist kept saying I won’t feel much but I felt everything from the start. I even complained out loud several times! I’m 6 weeks post natal and I drove this week. It was hard not being able to carry my 21 month old but we’re getting there. Oops this turned into an essay. Sorry! I really like listening to others birth stories. All births are different and you just don’t know what to expect. It’s all worth it when you see your little bundle of joy for the first time. Such an amazing experience.